Storing your files in the cloud is definitely much more convenient than storing them on a hard drive. When using a cloud service, you can access all of your files instantly from any device, and you never have to worry about losing your data again. However, if you are dealing with large files across multiple devices on a regular basis, using cloud storage is not just a matter of convenience. It is absolutely necessary. With so many different cloud storage services available today, how do you know which one to choose? 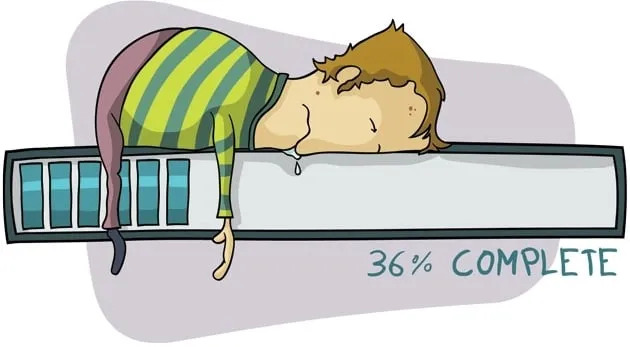 We all know that speed are very important to website and one of the key factor to faster loading website is to have a good website hosting. File transfer speeds are very important to cloud storage too, especially if you are dealing with large files. You spend 5x as much on your cable bill, shouldn’t you deserve something better and more efficient? If it comes to business, isn’t your business worth more than $35 a month? It is certainly essential for a business to speed up their website as we all know slowness affects revenue. It is the same when it comes to cloud storage, slowness affects efficiency. When choosing a cloud storage provider, it’s important to check not just the download speed they offer, but the upload speed too. If the upload speed is low, it could take forever to upload your files, which can be really frustrating. According to Broadband Genie, 35% of users never checked how much upload speed their ISP is providing to them. Upload speed averagely slower than download speed by 9X. We live in an age of massive information growth. File sizes ranging from few hundreds of MB to GB or even PB is common. We all need a quick solution for this. If you’re looking for a quick recommendation on the fastest cloud storage service, we’d go with pCloud. We are using their 2TB + Crypto bundle plan and our cloud storage comparison shows that they excel in comparing with competitors. Read our full review on pCloud here. It’s not the same no matter how people tend to present the data to you. You might heard a lot of advertiser bragging about how fast their internet service are, say 100mbps but you can actually find out their upload speed data in the fine print. It’s important to know how the upload speed in hand so everything runs smoothly and speedy. By actual uploading a test sample (100mb) and measuring the time being taken to finished the whole process. Upload speed is measured by testing the time for transferring a certain size of file – the amount of time it takes from your end to the destination server. Actual total time it takes to reach the data center or cloud storage server. Efficiency of the encryption process during transfer and how the upload process takes place. Not entire correct. We should look for a safe and secure cloud storage that is not sluggish in any way. You certainly do not want services that take forever to keep your data safe in place. Our testing process might be amateur and not accurate enough. But it’s the most practical and real world test that we can put together to show you how the upload process of a cloud storage actually works. We are normal users just like you too. What are the 2 most important things for Cloud Storage? When looking for a cloud storage provider, the two most important things are speed and security. If you are reading this article, you are most likely looking for the fastest cloud storage. However, there is one thing you should take into consideration if you want your cloud storage to be not only fast but also secure: secure cloud services will always be a bit slower due to encryption. Most cloud storage providers use encryption to protect your data while it’s being transferred and also while it rests in the cloud. All of the cloud storage providers on our list certainly do so. Check out our research on the most secure cloud storage too. 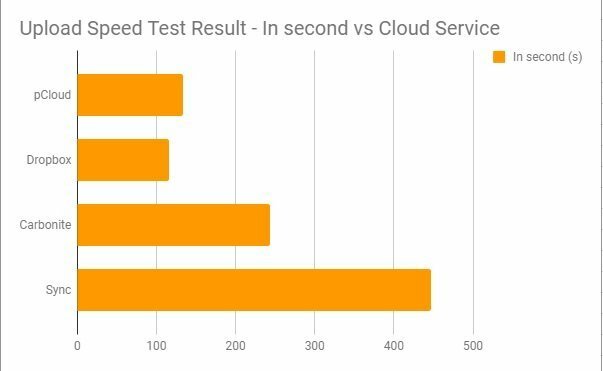 We’ve researched and tested some of the most popular cloud storage service providers in order to determine which one is the fastest. We have not only tested the upload speeds, but we have also compared prices, features, and security levels each of them offers. Dropbox has been around since 2007, and they are still one of the most well-known cloud services. Did you know Dropbox is listed in Nasdaq? What is the secret behind Dropbox’s popularity? The simple, clean design makes the platform incredibly easy to use and to set up. You just drag your files into your Dropbox folder, and you can access them whenever you want through the Dropbox website or one of their applications for desktop and mobile. There are no size limits when it comes to uploading files, but you only get 2GB of storage for free. However, you can get 3GB of extra storage space if you turn on the automatic photo upload feature on your Dropbox mobile app. You can also get extra storage space by inviting your friends to join Dropbox. Well, certainly I’m not a fan of referring. While Dropbox is certainly the fastest cloud storage among here, but if you look into Dropbox alternatives, it’s not hard to see why all the competitors are chasing up the game. Dropbox currently offers two personal plans – Dropbox Plus and Dropbox Professional. Dropbox Plus costs $9.99 a month (or $119 if bill yearly). You get 1TB of storage with this plan. $10 per month for 1TB is not terribly expensive, but you can find better deals with other providers, like pCloud, for example. Dropbox Plus do not have the feature like SmartSync and others. Check out my review about the Dropbox Smart Sync. Furthermore, some of the best features Dropbox has introduced lately are reserved for Dropbox Professional users. Dropbox Professional comes with some cool features, like password protection for our links, smart sync, and 120-day versioning. However, at the price of $20 a month, this plan might be too expensive for most of us. PCloud is definitely one of the fastest cloud storage services available, but that’s not the only reason why we love it. First of all, pCloud is incredibly comfortable and easy to use. There are no limits when it comes to the size of the files you can upload. Furthermore, pCloud works on all desktop and mobile platforms, and the Automatic Upload feature allows you to automatically synchronize data from multiple devices. PCloud offers a desktop tool, but most people prefer using the web interface. Using your browser, you can access all of your files, search through them, and filter them according to the file format. You can also view images, play music, and watch videos stored in the cloud storage service right from your browser. Another great thing about pCloud is the file versioning feature. By default, pCloud will keep older versions of your files for 15 days. If you are a Premium or Lifetime member, your files will be kept for 30 days. Additionally, you can buy the Extended File History add-on which will allow you to recover files a year after deleting them. The prices of pCloud services are quite reasonable. You get 20GB of storage for free, and you can pay $3.99 a month for 500GB or $7.99 a month for 2TB. You can also purchase a lifetime subscription and never think about monthly payments again. All of this sounds nice, but the advanced privacy and security features are actually our favorite part of pCloud. They use TLS encryption to protect your files during the file transfer, but that’s not all they have to offer. You can also purchase the pCloud Crypto add-on which will allow you to privately encrypt your files (only you will have control over the encryption keys). Find out how pCloud Crypto work in my review about pCloud here. Carbonite stands out among other cloud storage providers because it doesn’t limit the amount of data you can store in the cloud. However, Carbonite is primarily a backup service just like Backblaze, and it only lets you back up one device with a personal plan. Carbonite can handle all common file types. All you need to do is install the client and turn on automatic backup, and all of your files will be stored in the cloud. There are no limits when it comes to file size either, although you’ll need to add files larger than 4GB manually. Carbonite offers desktop clients for Windows and macOS. It takes less than two minutes to install any of them, and most of the processes are automatic which is nice. If you choose Carbonite as your cloud storage provider, you’ll also get access to top-notch security features. By default, Carbonite encrypts all of the files kept on their servers using 128-bit AES encryption. However, there is also the option to turn on zero-knowledge encryption, so you have complete control over your data. I’ve written a detailed review about Carbonite here too. Sync is a relatively young cloud service provider with a strong focus on privacy. The zero-knowledge architecture is the reason why many people decide to go with Sync. When using Sync, nobody will have the keys to your data except you. This kind of security doesn’t come without problems, though. Most importantly, if you lose your password, no one will be able to get your files back, ever. Even though their main focus is privacy and security, Sync’s interface is also very functional and elegantly designed. It offers fast syncing and easy file and folder sharing to maximize your productivity. The size of files you can upload is limited to 40GB, but this is more than enough for most people. You get only 5GB of storage for free, though. For $4 a month, you can buy a subscription that gives you 500GB of storage space. However, you can get 2TB for $8 a month, which is a really good price. Sync also offers some nice solutions for business users. You can get 10TB of storage with the Business Pro Advanced subscription. It costs only $15 a month, which is pretty amazing, and it also includes a range of additional features. Furthermore, sync keeps old versions of your files for up to 30 days by default, which is more than most other providers offer. If you upgrade to Sync Pro, you can store versions of your files indefinitely. In conclusion, Sync might not be fast but is certainly functional and affordable cloud storage service, but it also comes with the best security features available. Find out how this Canadian cloud storage manage to pump out 9 amazing features in my review about sync.com here. If we had to choose one cloud storage provider to use for the rest of our lives, it would probably be pCloud. It isn’t the fastest cloud service on our list, but it still offers decent upload and download speeds. Most likely is because of the encryption process that they had. Furthermore, all the plans offered by pCloud are reasonably priced and come with the best security features you can find. Luckily, there is no need to choose one cloud service and stick with it forever. But I would love to skip the headache afterwards by picking the correct cloud storage in the first place. It’s no joke when you need to migrate or transfer a tonne of files from one to another. Check out how much time you need to spend in uploading your desired data to the cloud storage server using our file transfer calculator tool for a better overall picture. All of the services on our list are fast (maybe except for Sync), secure, and come with all the necessary features.